PBK students for 10 years. They have spent more than half their lives on the Personal Best Karate mats, and have a powerful martial arts presence to show for it. Demonstration at the Black Belt Spectacular this past June. 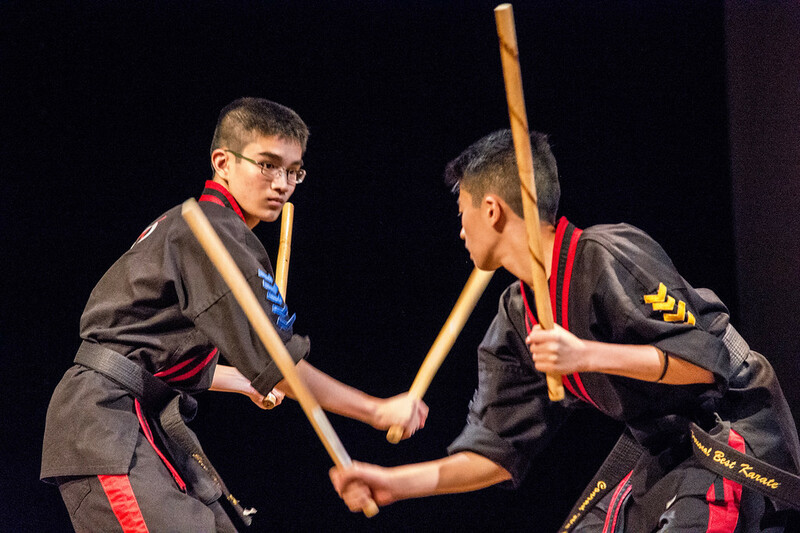 Both Eric, 17,and Conrad Wu, 15, are students at the Personal Best Karate School in Norwood, and just earned their Third Degree Black Belts this past June. 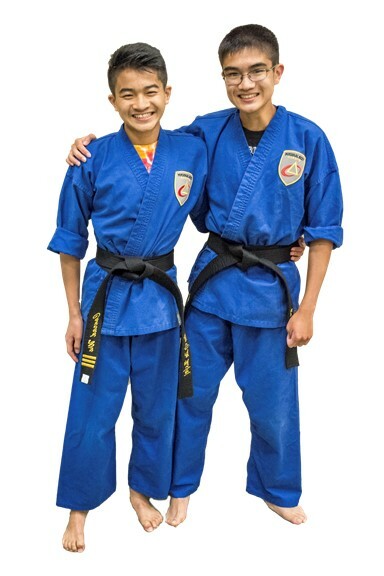 The training for their higher degree, plus their membership on the PBK Demonstration Team, have brought these two men to the forefront of time spent on the mat. However, that did not deter them from recently joining the PBK Competition Team and still remaining excellent students at Needham High School. "I think I have learned a good work ethic [at Personal Best]," said Eric, who will be a senior this Fall. "You have to have that, and determination, when you are in Training Cycle and for your school work." Both Eric and Conrad, a sophomore this Fall, credit learning forms helped teach them about precision and executing their power. "It's about learning the little details," said Conrad, on why the forms part of class was his favorite. Putting in 100 percent effort has always been the norm, said their instructor, John Mosca, owner of the Personal Best Karate in Norwood. "Both Eric and Conrad have set a pretty high bar for what a Third Degree Black Belt represents. Not only with their traditional training but also as members of the demo team," said Mosca. "I know that every where they go they represent Norwood and all of PBK to the highest level." And that is just why they started at the karate school in the first place. "Conrad had done an after school program and we signed up both of them right away," said their mother, Angela Wu. 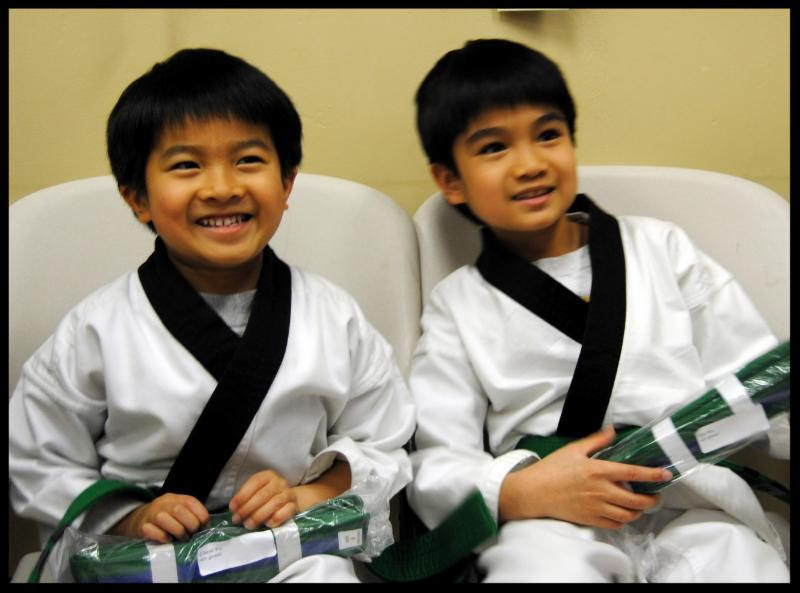 "We loved they would learn confidence and self-defense, but it was a lot about the STAR lessons. It helped me as a parent. I was teaching them the same things but it wasn't just me, now it was the school too. It was in print, so they had to listen," she joked. Their father, Raymond, agreed. "Being on the Demo Team has also helped their confidence. It's one thing to know your routine, but they have to sharpen their skills and perform in front of others." And why do they continue their training? "It's a lot of fun," said Conrad simply. "We're always making new friends."